Several movie theaters in Phoenix and Scottsdale offer a special movie-going experience: food and drinks served to you during the film. With luxury seating and food and beverage service inside the theater itself, you might never want to leave when the movie is over. From theaters with restaurants inside them to Bring-Your-Own-Beer (BYOB) theaters, Phoenix and Scottsdale are home to some great places to enjoy dine-in movie theater experiences. If you're visiting the Phoenix area and looking for a great way to catch the latest blockbuster, there's no better way to do it than while you're having dinner and drinks, too. Be sure to reserve your seats ahead of time and to select the right theater from chains like AMC and iPic, which both have locations around the country. South of Phoenix in Maricopa, the Ak-Chin Community built a mega entertainment complex, called the Multi-tainment Center, complete with UltraStar Movie Theaters. Two of the screens offer the StarClass experience, with food and beverage service available at your seat, but service is only available to adults 21 years of age and older. Menu options include specialty movie cocktails from the theater's "J-Bar," flatbreads, pizzas, and burgers, as well as classic movie treats like popcorn and candy. A server will bring you your food and drink, all you have to do is press a button on your recliner-style seat. In Scottsdale, at the Scottsdale Quarter, head to the iPic Theater for an upscale experience, and remember to come early for some adult beverages in the Salt Lounge or stay late for dinner at Tanzy. There are different classes of seats at these theaters, and Gold Class offers ​the most comfortable with truly reclining seats and food and beverage service. To book tickets in advance on the website, make sure you select "Scottsdale" for your location first! Located in North Scottsdale, Studio Movie Grill (SMG) is more down to earth than some of the other dinner-and-a-movie theaters in town, and so are the prices. Both reserved and non-reserved seating is offered here, but seats do not recline, unlike in other similar establishments around the area. However, SMG does have a larger menu than most movie theaters and nine large auditoriums that offer seat-side service. Located at the Scottsdale Pavilions on Indian Bend, the Roadhouse Cinemas Scottsdale operates in the former home of UltraLuxe Theater, which closed in 2015, and now offers different movie experiences in different theaters depending on age and types of seating desired. Depending on the rating and whether or not the screening is an all-ages event, the theater requires movie-goers be 18 or older—and 21 or older to drink. There's also a Roadhouse Cinema in Tuscon, Arizona, but this one's newer and has even more amenities! 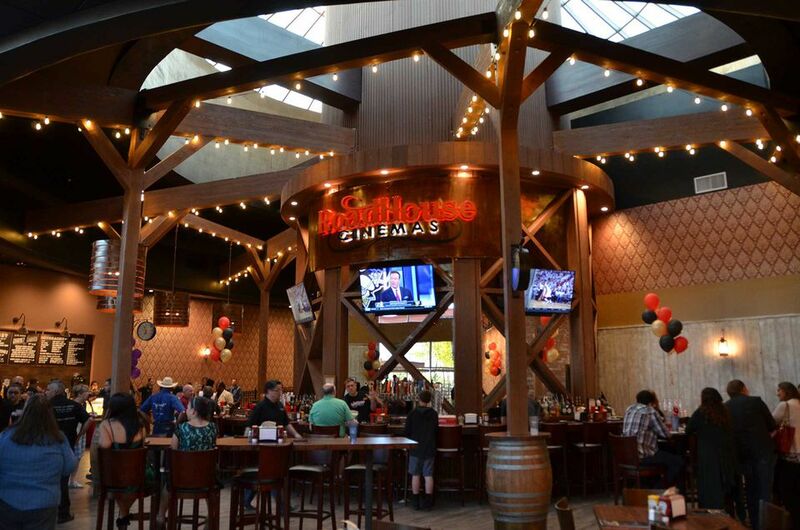 In Central Phoenix at The Esplanade on Camelback Road, you can order restaurant-style food and drinks, including alcoholic beverages, and be served in the theater at the AMC Dine-In Esplanade 14. Food prices from MacGuffins Bar were a little more expensive than they are at other theaters, but the reserved-seating in huge recliners with pull-out trays really make it worth the cost.